Aquatic sports are distinct from other sports in that the athlete functions in an environment devoid of gravity. 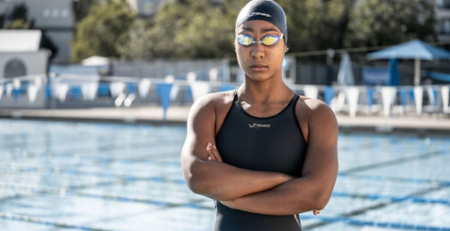 A swimmer must rely on the athlete’s ability to generate propulsive forces using their arms and legs while attempting to minimize drag resistance in order to propel themselves as efficiently through the water as possible. For this reason core muscle conditioning is important to improving swimming performance. Core strength allows a swimmer to maintain a streamlined body position in the water and speed through the water more efficiently. 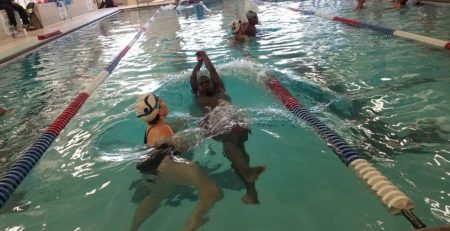 Dale Mohammed has been swimming, coaching and judging Synchronized Swimming for 30 years and is also a certified Water Safety Instructor, and Aquastrength Instructor. Dale has put together a series of land and water exercises and drills to supplement Swim Strong’s normal workout to allow the swimmers to improve their awareness of their core muscles and start developing core strength. Are YOU one of the 37% of ADULT Americans the Centers for Disease Control says cannot swim the length of a 25 yard pool?